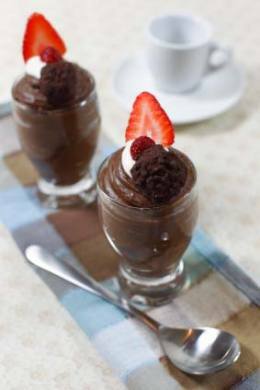 This fabulous mocha mousse is the perfect delicious dessert for Valentine's Day. In a small saucepan, heat 1/2 cup heavy cream until wisps of steam come off it; stir in the instant coffee; do not let it boil. Meanwhile, in the bowl of a stand mixer, beat the egg until it’s light yellow and frothy – about 3 to 5 minutes; add the sugar a little at a time until well combined. At the same time, beat the egg in the bowl of a mixer until light yellow and frothy; gradually beat in the sugar; add half of the warm heavy cream/coffee mixture to the mixer and beat well. Pour the egg mixture from the mixing bowl into the saucepan and whisk thoroughly; cook on low for 5 minutes, whisking constantly. Stir sugar, egg, and Irish Cream mixture into the saucepan; cook on low for about 5 minutes, whisking constantly; add the chocolate to the saucepan and whisk until melted; remove from the burner. Cover the pot with a tight fitting lid. Place in the refrigerator for 2 hours, stirring once. Remove the pot from the refrigerator. In the bowl of a stand mixer, beat the remaining 3/4 cup heavy cream until stiff peaks form; add the chocolate from the pot to the mixer and beat on low until just starting to combine; increase the mixer speed to high and beat until fully combined. Transfer the mousse into four serving glasses (martini glasses work great!). Chill until ready to serve. Top with a dollop of homemade whipped cream just before serving.